I WON FEEDSPOT'S TOP 100 ILLUSTRATION BLOGS! http://blog.feedspot.com/illustration_blogs/ YOU ARE ABOUT TO READ AN AWARD WINNING BLOG! THANK YOU FEEDSPOT! As you may, or may not know, I wrestle with this blog. I always put a great deal of effort into it. It takes a whole day a month, it's my personal experience of my job which is never a comfortable feeling is it, having to talk about yourself? However, saying that, big up yourself! When you win an award for something that makes you go all cross eyed and spaced and to be ranked after two years into the old biznizz it all seems worth it! WOOOO! Here's a still of me laughing my absolute head off with my good friend and colleague Lee Ramsay who made a sensational official video for Breakin' Convention Nottingham 2017. You can watch the full masterpiece here: https://www.youtube.com/watch?v=2GQVr6cgyRo MASSIVE thanks to The Anti Gallery for inviting me to exhibit. You really are the best. Blue Cheese Vs Emily Catherine Illustration Lowits Collabo Tee available to buy on here! Next magical thing? I only got bleddy published again dint ah yer boggers? One thing you'll notice is I tend to intimate I'm really busy then you won't actually see any result? Well this is because, like buses, work tends to complete all at once! Now, one cannot control what your clients or collaborators announce, or when, and quite right too, but often, if something suddenly 'goes live' I have to get my marketing head on pretty quickly and help promote it. These sentiments, expressed on an old postcard found at a Dublin flea market in 2010, unearth for Alannah the ill-fated love story of Micheál and Eileen set during the Irish War of Independence and Civil War. Mirroring the prophetic words of W.B. Yeats ‘things fall apart’, Micheál and Eileen are immersed in the events of the time, full of passion, courage, idealism and hope. Tragedy ensues and it is left to Alannah to reconcile the outcome a century later in a way that brings her intimately and surprisingly in contact with both Micheál and Eileen. Set in County Cork, this historical novel describes the turmoil of a people in their quest for identity. 'The Drowning Of Innocence' by Padraig O'Gorman by Icon O'Clast Press illustration by Emily Catherine Illustration 2017. You can literally turn the book upside down and the image still makes sense. I also illustrated the little pencil illustration of the postcard inside the book. Emily Catherine Illustration postcard illustration for 'The Drowning Of Innocence' by Padraig O'Gorman by Icon O'Clast Press. So, every year Surface Gallery hold their Street Art Festival 2017 which is their biggest and most successful show of the year. Throughout the exhibition, the gallery work with the local community to hold events which tie-in with the exhibition and works closely with contacts and local bodies in the graffiti and street art community to help. This time of year is always busy, stressful and jubilant all at once. In some ways we all dread the amount of work we are about to partake in, and yet get so excited because it always comes off as successful and joyous. To undertake what everyone does is genuinely a miracle. Surface gallery is a volunteer led, underfunded, gem of a gallery who try to throw a spotlight on some of the less known artists in the city whilst also managing to put on very professional and slick exhibitions. When a small group of volunteers are running large scale events which are becoming increasingly more and more popular it's a massive credit to our city and creative community. It's not my job to shout out all the many people that made this year wonderful, but, from me personally, to every single person that pulled in favours, painted for free, organised it and gave permissions, financially backed it, stayed awake at night with furrowed brows about it, literally everyone, THANK YOU. It's such an incredible opportunity and wouldn't be possible without everyone's individual efforts. First event was Sisters Of Street, an all female painting event. Surface put on a screamingly vibrant event full of solidarity in the face of adversity. 'why all female?' Why not? 'Why not have a mixed event?' We do. 'Why not have all male?' Because it's a predominantly male dominated world, the art world, so better to highlight and expose the talent that struggle to be seen than ignore them as normal? No? You think that's positive discrimination? Well, if you take issue with that then you take issue with the very fact that it's a Street Art Festival and not a Fine Art Festival. Surface Gallery work tirelessly trying to smash these myths and bust some prejudices. It's important to provide a spotlight for minority artists whether it be because of race, gender, sexuality or practice because otherwise people literally don't see them, fact. If you think people should work hard for their recognition, you'd be right, but here's the thing, they already do! How would you feel if the only trees you ever saw were Christmas trees and all the other trees were still there but you only read, watched and heard Christmas Trees? The media control what we see, that becomes knowledge, knowledge becomes fashion, fashion becomes taste. See it as a gift! We're offering you different trees to experience for one day out of year. You may fall in love with a Eucalyptus! You may covet a conifer! You may go bonkers for a bay! If you want to read a little recent interview I did about being female in the arts for the awesome Women Who Create, you can, here! Next up was the amazing finale event Block Party an old skool traditional Block Party like they do in the Americas! 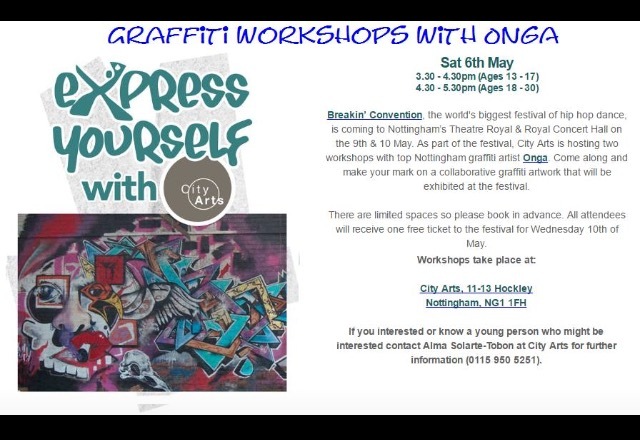 Hosted on Sneinton Market, an area of much needed regeneration, but in the city centre, Surface Gallery's colleague Tim Onga (OG of graffiti himself) organises artists, some small, some BIG names, from all over the world to decorate the market once a year. He hosts an independent market for everything you might want to buy: arts, food, fashion, curiosities. Food traders provide authentic home cooked streetfood. An all day bar is licensed with refreshments. Music is provided by Tekonta, a bespoke made UV soundsystem and PA (this year an octopus!) as other independent artists take to the mic to perform. The whole community is invited to go a see the artists spraypainting, get involved with the music and traders and to, well, party! The afterparty was held at Rough Trade which featured a doodle-off and live scratch djs, all in all an incredible day and night! I was given a spot this year to paint with the professionals! Not only that but the pressure was quite significantly on as my spot, a gable end set of window panels on Bath Street, was in between Kid Acne's piece on my left, and Dilk's on my right! Both are reknown and very well respected artists. On top of that, the location happens to get a lot of traffic. A LOT. I was tasked with wondering how to tackle it. Should it be a serious and thought provoking piece, beautiful and whimsical? I felt like I wanted it to be funny. After all, the geo-political landscape is pretty awful and depressing. Why would I want to add to somebody's daily commute with yet another thing to worry about? You know if you have read this blog before that my brand of humour is pretty gutsy but this time I had to have a bit of decorum. So I came up with perhaps an 'in-joke'. So I planned to create a 'Posh Emoji Gallery'; four gilt frames of emojis which denote a sexual connotation. At first glance it would look like an innocent selection of subjects, when the penny drops you realise I've covered each sexual emoji base! Come drop by the studio to have your photograph taken, printed in house, for one of our amazing guest illustrators to embellish you; creating a unique one-of-a kind portrait to take home that day. Whatever your style or personality, these guys are The Dog's... whether it's for a family, child, self, friends or pet portrait. Chilled beats & beers in the secret garden. No need to book, just like, join and share this page with your friends - details on prices, artist bios and further info to follow in the coming weeks! Now for the fun bits! As you know I like to finish the blog with happy things or a joke. THIS IS ME USING VERY SERIOUS HIGH TECH EQUIPMENT IN MY VERY HIGH TECH STUDIO WITH BRANNIGANS! THIS IS MY CACTUS TRUMPET THAT TOOTS ONLY FOR 24 HOURS ONCE A YEAR! THIS IS A WINNING MEDAL. FACE. MEDAL. FACE.